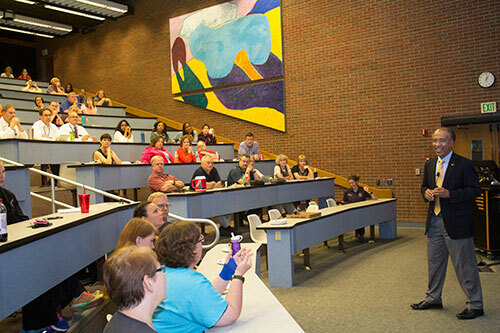 Dean Reed answers questions during a forum July 26, at which the dean shared the news on the hospital construction with PVM faculty and staff. Expected completion of the first phase of building is anticipated by May 2020. The Purdue University Veterinary Teaching Hospital is set to break ground on a new location in 2018, complete with three new contemporary buildings. Purdue's Board of Trustees discussed the new construction on Friday, August 4, and approved funding for the project's first phase, a 76,600 square foot equine hospital. The second and third phases will consist of a new small animal hospital and one for food animals such as cattle, small ruminants and other food animals. The Board of Trustees authorized the expenditure of $30 million to fund the construction, and an additional $5 million will come from philanthropic efforts, for a total project cost of $35 million. The board will review the second and third phases for possible funding from the Indiana Legislature in 2019. "We are happy about this commitment because it fulfills a significant goal of our strategic plan," said Dean Willie Reed. "A new hospital helps us continue to recruit top-notch students, retain our elite faculty, grow our caseload, and train the next generation of veterinary students." The first phase of the projects will include space for large animals, including space for surgery, physical examination and diagnostics, and an intensive care unit. It will be constructed east of Lynn Hall after the demolition of South Campus Courts and Frehafer Hall. Parts of the Veterinary Medical Complex that are still in use today were built in the early 1900s, and have been retrofitted many times over the years to add new technologies and accommodate increased enrollment. "Our original building, Lynn Hall, was designed for about 50 students per class and was constructed in 1959," said Reed. "In those days we did not have a veterinary technician program or offer internships or residencies, and there was limited research space. Since then, we have expanded research, increased DVM student enrollment and developed sizable residency and internship programs. We need modern and updated facilities to address these needs." Design for the new equine hospital will begin in October, and construction is tentatively scheduled to begin in September 2018, with expected completion in May 2020.